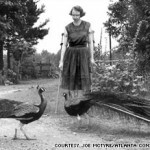 Friday the 25th of March marked the 86th anniversary of Mary Flannery O’Connor’s birth. Since her death in the summer of 1964 her literary reputation has steadily increased—this fact is often noted by her critics and admirers, but it is still a marvel to recognize just how pervasive the name of this Christ-obsessed oddball, unprolific and unheralded in her own day, has now become. One sure mark of an author’s literary ascent is the quantity and variety of partisan “critiques” devoted to her work. New York University’s Bobst Library, for instance, boasts such titles as The Body in Flannery O’Connor’s Fiction: Computational Technique and Linguistic Voice, in which Donald Hardy runs O’Connor’s collected works through a computer program so to determine “the stylistic effect of the conceptualizations of the unified and bifurcated self” (Hardy, 123) and New Essays on Wise Blood, in which James M. Mellard submits a radical Lacanian reading of O’Connor’s first effort. A popular Freudian literary scholar at the University of Chicago recently gave a seminar in which he recounted the hours of agony he spent trying to find triadic significance in the speedometer reading (55890) mentioned in the O’Connor story “A Good Man is Hard to Find.” “So far I’ve got nothing,” lamented the poor pedagogue. The other mark of a writer’s ascent is the comprehensive literary biography. This was taken care of a few years ago by Brad Gooch with his Flannery: A Life of Flannery O’Connor (Little, Brown). O’Connor’s friend Sally Fitzgerald apparently dissuaded Gooch from undertaking this project when he first conceived it in 1980, writing to him that she was preparing her own biography of theO’Connor deceased. With the failure of this volume to appear, however, and with Fitzgerald’s own death in 2000, Gooch gave himself the green light and released his book in 2009 to wide acclaim, which is to be found distributed generously on the paperback edition’s front-flap, back-flap, and first eight pages. The front-flap praise comes from Time magazine: “Flannery O’Connor’s life was as dark and rich and dense with meaning as her fiction is.” This is certainly false. 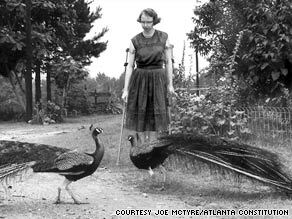 Flannery O’Connor was born in Southern Georgia, attended school there and in Iowa, lived peacefully in rural New York and Connecticut as she worked on a novel, returned to a family farm in Central Georgia due to a debilitating illness (lupus), continued to write a great deal, then died at thirty-nine after a gradual worsening of this illness. In between she conducted several epistolary friendships and somewhere between zero and one love affair. Given only the ostensible facts of O’Connor’s life, not even the most generous could call it “rich.” And aside from the occurrence of death—an event that takes place at the end of all lives, rich or otherwise—it contains nothing particularly dark. What makes O’Connor fascinating to us is her literary genius, not her life on the farm. It was her own history’s clear lack of intrigue that brought O’Connor to write, in a letter to friend and confidante Betty Hester, “[a]s for biographies, there won’t be any biographies of me because, for only one reason, lives spent between the house and the chicken yard do not make exciting copy.” Gooch coyly chooses this passage for his work’s epigraph, and although he has proven her wrong by means of Flannery’s publication, his research has not produced any revelations to discredit the general sentiment of her dismissive quip. More ample and entertaining accounts of O’Connor’s life after her move to the Milledgeville, GA—the period of her creative flourishing—can be found in her own letters, collected by Sally Fitzgerald in the excellent The Habit of Being (Farrar, Straus, Giroux). And indeed the latter half of Flannery is a compression of that book, with digressions at the apparently juicy parts. These include a first-hand report of what we can guess is O’Connor’s only kiss, with the intellectual Danish textbook salesman Erik Langkjaer; and the romantic feelings harbored by O’Connor’s two favorite correspondents, Betty Hester and Maryat Lee—the former a closeted lesbian residing in greater Atlanta, the latter a bisexual Kentucky “bohemian” living in New York. Apart from these overwrought elaborations on romantic feelings (Gooch makes much of a few uses of that ambiguous word “love,” without providing much context), Flannery does provide some satisfying O’Connor trivia and fuller versions of certain events only hinted at in The Habit of Being. These include Caroline Gordon’s mentorship of the young author; the anti-Communist hubbub at the Yaddo writer’s colony in New York; Robert Lowell’s conversion to Catholicism and subsequent breakdown; and O’Connor’s own tenement house in Morningside Heights, where she was living before her lupus first flared up on a train back to Georgia. Yet these and other events are made interesting primarily by O’Connor’s and her friends’ writing, not by Gooch’s. Gooch also sporadically attempts appraisals of O’Connor’s art. These digressions, despite their infrequency and slightness, still manage to misjudge her. They are characterized generally by a desire to connect O’Connor’s work with topical issues and various critical trends, a desire which diverts attention from the stories’ more obvious provenance: O’Connor’s Catholic faith. Of the story “A Circle in the Fire,” in which a group of hoodlums raze a well-to-do woman’s country farm, Gooch writes that “[t]he incipient sexual violence of the story… isn’t entirely an indication of sexual repression.” Forest fires, Gooch tells us, were actually quite common in those parts of Georgia—as though O’Connor’s aim were to draw attention to the dangers of “flammable pine” nearby her home. “A View of the Woods,” about a spry old man who ends up beating his nine-year-old granddaughter to death, is “political in its ecological implications,”—because the story’s characters argue about whether or not to sell a plot of woods. “Greenleaf,” about a sanctimonious middle-aged woman who is accidentally gored by a bull, “almost seemed written to prove [Savannah Morning News contributor Ben Griffith’s] theory about mythic, folkloric elements in [O’Connor’s] work.” Gooch claims that the bull in this story is “at least Zeus… if not Christ…”—and though these two figures should strike one as sufficiently disparate as to deserve some clarification here, Gooch does not give it, nor does his appraisal or O’Connor’s story itself provide evidence that this sort of blunt-faced symbolism, which always so infuriated the author, is warranted. Gooch’s strategy here is to provide O’Connor’s fiction with broad critical appeal. To stress the Catholic influence in every O’Connor story would be monotonous, and to stress just how severe the author’s Catholic vision was would be unsavory. It might not be a winning formula to emphasize that O’Connor considered the topical matters that so engross certain readers—questions about the effects of consumerism, deforestation, and sexual repression—trivial compared to the fate of a single person’s soul. It would, however, be accurate. The impulse to rescue O’Connor from her own Catholicism is one that seems to drive much contemporary praise bestowed on her, and can be found in two of the most prominent reviews excerpted on the dust jacket and opening pages of Gooch’s book. These come from Joyce Carol Oates, in the New York Review of Books, and Joseph O’Neill in the Atlantic. The idea then, briefly, is that physical world we know represents a horrifying departure from its natural state, just as man infected by sin represents a horrifying departure from his natural state. The Christian writer of fiction must convey extreme examples of these departures because the secular reader perceives the rest of them as normal. Of course O’Connor knew that she was “touched by evil” if what is meant by this phrase is that she was not morally pure—“I am not a mystic and do not lead a holy life,” she writes to Hester, “nor can I claim any interesting or pleasurable sins… but I know all about the garden variety, pride, gluttony, envy and sloth, and what is more to the point, my virtues are as timid as my vices.” Yet this fact does not prove her fiction to be “derived… from an artistically wholesome tradition of misanthropy,” as O’Neil claims it does. If it did, then all fiction not written by saints would be misanthropic, and this “artistically wholesome” (which perhaps means, simply, artistic?) tradition would be the only one to exist. But of course it is not, and O’Connor was no misanthrope, for to ridicule conventionalized dissolution and canonized stupidity does not make for misanthropy. This is worth noting, because while some readers like O’Neil might delight in the violence and apparent nihilism of O’Connor’s work, both her novels and most of her stories contain acts of spiritual heroism. The grandmother in “A Good Man is Hard to Find” recognizes the Misfit, who has just murdered her extended family, “as one of [her] own babies.” Noxious, stubborn Julian in “Everything That Rises Must Converge,” finally fights against “[t]he tide of darkness… postponing from moment to moment his entry into the world of guilt and sorrow;” young Tarwater in “The Violent Bear it Away” moves steadily on toward the city, to preach the terrible speed of mercy. Apparently there are many readers for whom these moments of grace are inessential and who still enjoy O’Connor’s fiction. This was always a source grief for the author of these works, though she realized it came with the job. Still though, such critics should probably refrain from implying that O’Connors herself was evil or misanthropic, simply because their interpretations of her work are confined to only one aspect of it. There are a few problems with this characterization. For one, Chekhov was no stranger to caricature or violent endings (both of which are to be found, for example, in the hilarious “Death of a Petty Official”). More importantly, though, O’Connor cited James as a foremost literary influence, and her own stories should be seen precisely as a continuation of the “epiphany” model practiced in Joyce’s Dubliners. Also, if the fine wringing Oates mentions is to be equated with the act of writing, then O’Connor, a notoriously slow worker and indefatigable reviser, wrought her stories as finely as anyone. The matter of spiritual epiphanies in the vein of Dubliners bears emphasizing, because it is this aspect of O’Connor’s fiction that saves her from being no more than the caricaturist Oates describes. Take “A Good Man is Hard to Find,” the famous story which Oates cites at the end of her article to demonstrate “the two-dimensionality of [O’Connor’s] cartoon art” and to show how O’Connor’s stories “read like parables of human folly confronted by human mortality. ” Yet the story is in truth neither “cartoon art” nor parable. In the story a pushy grandmother, her cat, her emasculated son, his vegetative wife, and their three children travel by car on a short vacation to Florida. The grandmother would prefer they go “to visit some of her connections in East Tennessee,” and warns that a serial killer, who goes by “The Misfit,” is on the loose in Florida. Her advice unheeded, she embarks with them anyway. Thus summarized, the grandmother’s graceful action toward the man about to murder her seems stilted. But as in Joyce’s stories, the secondary spiritual plot has been developing at the same speed as the observable action. We have “The Tower,” a new Babel where the inhabitants speak in the common language of pieties. We have the monkey mimicking human myopia, savoring his lousy delicacies. And we have the many seemingly gratuitous mentions of death—after describing the grandmother’s collar and cuffs, for instance, our narrator relates that “anyone seeing her dead on the highway would know at once that she was a lady.” For all her humor, O’Connor is busy in the first half of the story setting up the themes to be addressed later by the Misfit, and invigorating each country truism with an undertone of menace. This is no cartoon, but a complex tapestry, where the simplest phrases bear multiple meanings and each gaudy image betrays intricate patterns beneath. The story is no parable, either. If it were, what message would it illustrate? Don’t travel to a state where a serial killer may be? Don’t take back roads? Don’t bring a cat in the car on vacations? When you encounter a serial killer, keep your mouth shut? Nor is the message to be a better person than the grandmother. O’Connor knows and we know that many sanctimonious grandmothers are not killed for their smugness. Rather, the story is an example of realism in exactly the ways Oates claims it is not—one in which the author “struggles to establish the trompe l’oeil of verisimilitude.” O’Connor painstakingly picks her details and uses them to put forth convincing characters, then presents these characters with a conflict and finds out how they will react. The violence of this conflict does not diminish its realism. If the grandmother’s death were in fact the explicit effect of some earthly cause—social backwardness or an unhealthy penchant for back roads—then the story would be cartoonish, or at least tasteless. But unlike a political cartoon, O’Connor’s story, and her work in general, has no single target in mind. For O’Connor, the visible world is essentially corrupt, and her realistic portrayal of it conveys this fact. This is what makes her fiction religiously informed without being pedantic: her theology supplies the setting, while her characters’ free will decides the rest. The fact that the world O’Connor chooses to evoke is a violent one does not make her a misanthrope, nor does it make her a caricaturist. Rather, it reflects her Catholic worldview—an essential aspect of the author’s work, whether or not her readers care to suffer it.